Federal testing has failed to confirm green onions as the source of an outbreak of E. coli that sickened 64 people who ate in Taco Bell restaurants in the Northeast, health officials said Monday. Over the weekend, Taco Bell officials said they determined that scallions were the likely source of the bacteria. But follow-up federal testing of those samples were negative for E. coli. "In that context, we have not ruled out any food items," said Dr. David Acheson, chief medical officer for the FDA's Center for Food Safety and Applied Nutrition. Health officials in New York said a sample of white onions taken from a Taco Bell restaurant tested positive for E. coli. However, that strain of bacteria hasn't been linked to any cases of illness in the United States anytime in the previous 30 days. 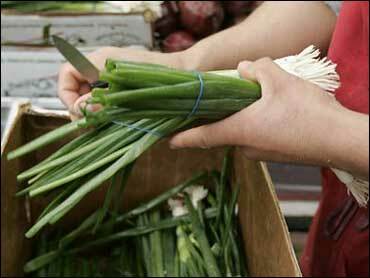 The positive sample initially was mistakenly identified as being green onion, Acheson said. "The bigger possibility is that these white onions were contaminated somewhere else, the supplier or the grower. We don't know that," Acheson said. "It does not match any strain of any illnesses in the past 30 days." The Centers for Disease Control and Prevention has confirmed 64 E. coli cases in five states, most in New Jersey, New York and Pennsylvania plus two in Delaware and one in South Carolina. The South Carolina patient had eaten at a Pennsylvania Taco Bell. A New York City resident fell ill after eating at Taco Bell and health officials confirmed that E. coli was the culprit. The victim, identified only as a Staten Island resident, has since made a full recovery. This was the first time the strain was found in the city. Meanwhile, nearly three dozen people have fallen ill with symptoms consistent with E. coli infection after eating at a Taco John's restaurant in Cedar Falls, Iowa. And authorities were investigating a case in which several people became ill after eating at a Taco John's in Albert Lea, Minn.
Kirk Smith, with the Minnesota Department of Health, said tests were being conducted to determine whether the illnesses were related to illnesses in Iowa. Three Minnesotans with the symptoms are ages 17, 35 and 57, the Star Tribune of Minneapolis reported on its Web site Monday. The oldest person has developed a kidney complication and is hospitalized, the newspaper said. Paul Fisherkeller, president of the Cheyenne, Wyo.-based Taco John's, said in a statement, "We hope for the speedy recovery of anyone who has fallen ill and are cooperating fully with health departments in both states, while also conducting our own investigation." There is no indication the outbreaks at the two taco chains are linked, but the CDC has not ruled out a connection, said Dr. Christopher Braden, a medical epidemiologist with the agency. Iowa officials suspect a sick restaurant worker could have spread the illness. The two restaurant chains are not related. It could take until midweek to determine if the Taco Bell outbreak is over, Braden said. However, there have been no reports of anyone falling ill after Dec. 2, he added. Taco Bell continued to exclude scallions from its ingredient list despite the FDA's finding. "We won't be considering any changes to our decision until the FDA and CDC conclude their investigation," Taco Bell spokesman Rob Poetsch said. Taco Bell President Greg Creed said that independent testing on ingredients served in the chain's restaurants did not indicate the presence of E. coli bacteria. "As nearly half the entire U.S. adult population eats at a Taco Bell at least once a month, it's easy to understand how we might be considered associated with this illness," Creed said in a statement issued from Irvine, Calif., where the subsidiary of Yum Brands Inc. is located. "Based on this testing and all that we know today, I can reassure you that all Taco Bell food is safe and strict standards are being upheld at all of our restaurants," he said. E. coli is a common and ordinarily harmless bacteria, but certain strains can cause abdominal cramps, fever, bloody diarrhea, kidney failure, blindness, paralysis, even death. It is found in the feces of humans and livestock. E. coli infections are associated with undercooked meat. The bacteria also can be found on sprouts and leafy vegetables. The germs can be spread by people if they do not thoroughly wash their hands after using the restroom.